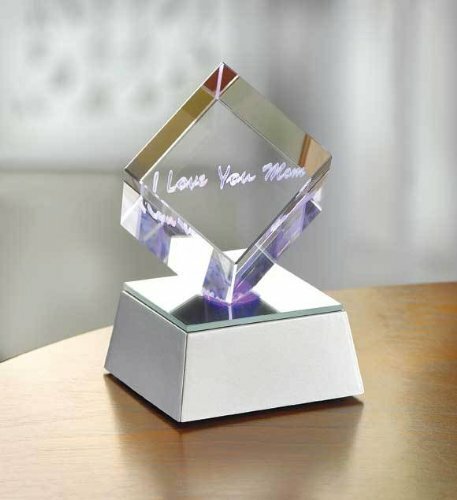 An LED base lights up this clear acrylic cube to set the words "I Love You Mom" aglow at its center. Uses 3 AAA batteries (not included). 2-1/2-inch square by 4-inch high. Show Mom how you feel with our Mom Poem collection piece. 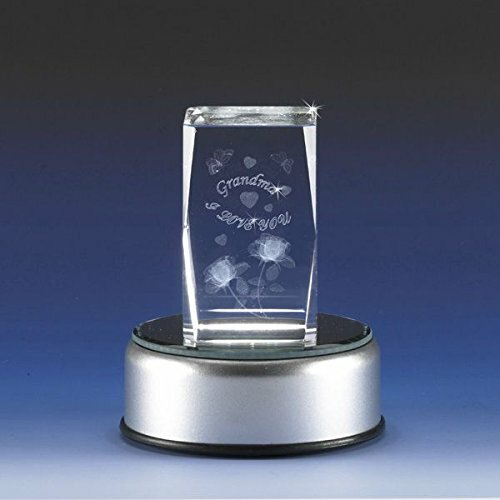 This 3D laser etched crystal cube features a stunningly detailed display of roses, hearts, and butterflies. The touching poem within makes this a cherished keepsake for any mother. This crystal clear block stands 5 3/4 inches tall, and is 1 3/4 inches wide. Add a lighted mirror base with this piece to illuminate all the intricate details of this heartfelt design. Poem Reads: "Your love which surrounds me, is a reflection of you. There is no greater blessing than a Mom just like you! I Love you Mom! Small LED Light Base is operated by 3 AA or AAA batteries, multi-color changing LED lights. Large LED Light Base is operated by batteries OR by the power cord that is included. The large base can also rotate in circles with multi-color changing LED lights. Mom Poem 5 3/4" T x 1 3/4"W Show Mom how you feel with our Mom Poem collection piece. 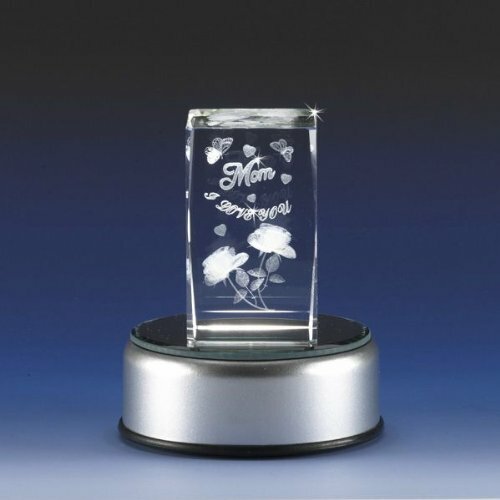 This 3D laser etched crystal features a stunningly detailed display of roses, hearts, and butterflies. The touching poem within makes this a cherished keepsake for any mother. This crystal clear block stands 5 3/4 inches tall, and is 1 3/4 inches wide. Add a lighted mirror base with this piece to illuminate all the intricate details of this heartfelt design. Poem Says: "YOUR LOVE WHICH SURROUNDS ME, IS A REFLECTION OF YOU. THERE IS NO GREATER BLESSING, THAN A MOM JUST LIKE YOU! I LOVE YOU MOM". YOU WONT BE SORRY YOU MADE THIS PURCHASE!! THE LIGHT BASE DOES NOT COME WITH IT, BUT YOU CAN PURCHASE IT IN MY STORE. IT IS A MULTICOLORED SILVER LIGHT BASE THAT SLOWLY TURNS AS IT SHINES THROUGH THE LASER CUBE AND MAKES IT SHINE! THE LIGHT BASE IS A MUST FOR THIS GIFT! I Love You Mom! 5 3/4" T x 1 3/4"W Show Mom how you feel with our Mom collection piece. This 3D laser etched crystal features a stunningly detailed display of roses, hearts, and butterflies. The Sentiments within makes this a cherished keepsake for any mother. This crystal clear block stands 5 3/4 inches tall, and is 1 3/4 inches wide. Add a lighted mirror base with this piece to illuminate all the intricate details of this heartfelt design. "I LOVE YOU MOM". YOU WONT BE SORRY YOU MADE THIS PURCHASE!! THE LIGHT BASE DOES NOT COME WITH IT, BUT YOU CAN PURCHASE IT IN MY STORE. IT IS A MULTICOLORED SILVER LIGHT BASE THAT SLOWLY TURNS AS IT SHINES THROUGH THE LASER CUBE AND MAKES IT SHINE! THE LIGHT BASE IS A MUST FOR THIS GIFT! Express your love with our Mom I Love You collection piece. 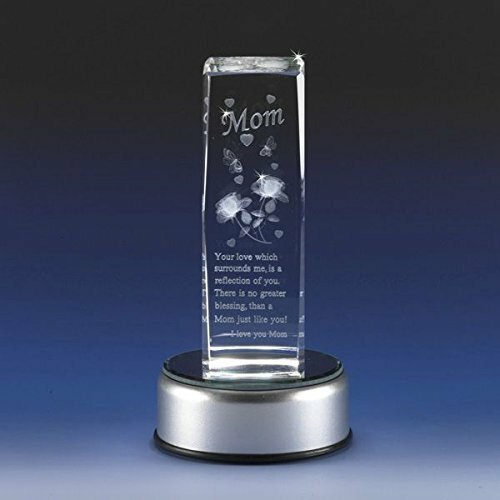 This 3D laser etched crystal block features a stunningly detailed display of roses, hearts, and butterflies. The inscription "Mom I Love You" is perfectly placed within. This crystal clear block stands 3 inches tall, and is 1 3/4 inches wide. Add a lighted mirror base with this piece to illuminate all the intricate details of this amazing design. 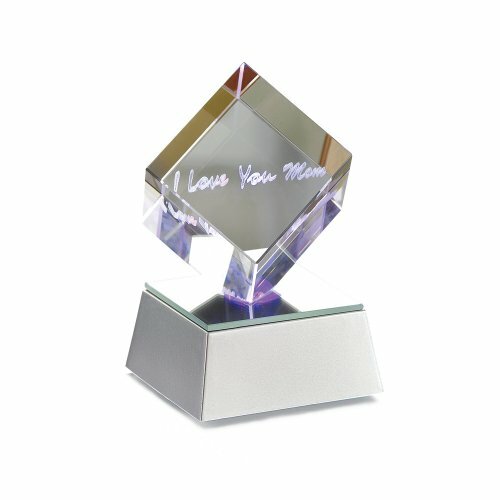 I Love You Grandma is a 3D laser etched crystal block featuring a stunningly detailed display of roses, hearts, and butterflies. The inscription "Grandma I Love You" is beautifully written within the piece. This crystal clear block stands 3 inches tall, and is 1 3/4 inches wide. And Includes a lighted mirror base to illuminate the intricate details of this amazing design. It can make an incredible nightlight. 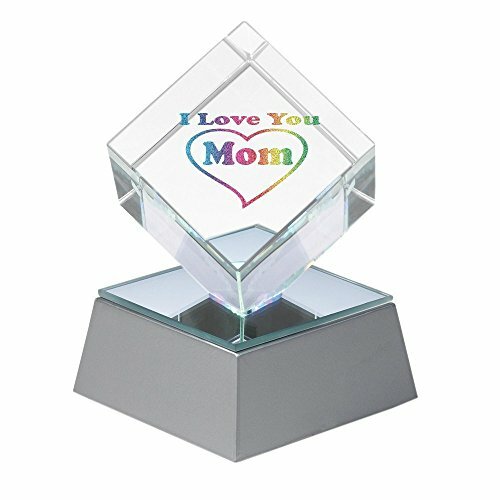 Looking for more Mom Lighted Cube similar ideas? Try to explore these searches: Third Eye Pro Helmet Mirror, Enclosed Track, and Floral Vase Table Lamp. Look at latest related video about Mom Lighted Cube. Shopwizion.com is the smartest way for online shopping: compare prices of leading online shops for best deals around the web. Don't miss TOP Mom Lighted Cube deals, updated daily.